Websites get hacked every day. Our passwords are rarely as strong as we think. Sometimes we (or our clients) delete the wrong file or make a change that breaks something. How about waking up one morning only to discover your website was hacked; or worse still, your web host accidentally deleted your website. Since a backup isn’t available, it means you will have to develop your website again from scratch. However, if a backup was available, you simply could have restored the backup and your website would be up and running again. WordPress arguably is the leading content management system for building websites. Due to its popularity, it has become target for hackers, bots and spammers. Due to the frequent compromise and hacking of websites by hackers and malicious bots, it’s important that we backup our websites on a regular basis, especially when it’s easy to do with a number of WordPress backup plugins. In this article, we will go over six of the best backup plugins and their features in order to help you choose the right one that will suit you. This has been my favorite backup plugin since I started using WordPress, available for free at the plugin directory. With this plugin, you can schedule the backup of your entire website (folders, files and/or database), set how often you want the plugin to take your website backup, choose where the backup will be saved to e.g. on the local website, sent to an email address as an attachment or stored in a distant server over FTP. Is your website running WordPress multisite? Keep calm, you’re covered. UpdraftPlus simplifies WordPress backups and restoration. The backup can be saved using a cloud storage service such as Amazon S3, Dropbox, Google Drive, Rackspace Cloud, Bitcasa etc. 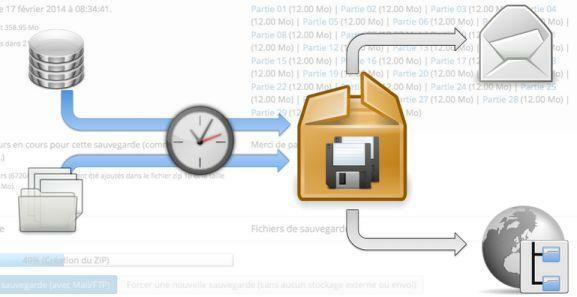 The backup also can be saved to an offshore web server via FTP or SFTP. With a single click, the backup can be restored in a short time. Other features worth mentioning include backups of files and database can have separate schedules, failed uploads are automatically resumed/retried, and ability to select which components of a backup to restore. BackUpWordPress will back up your entire site, including your database and all your files on a schedule that suits you. It’s super easy to use, with little or no setup required. Features of this backup plugin include the ability to function using low memory, “shared host” environments, the option to have each backup file emailed to you, works on Linux and Windows servers and the ability to exclude files and folders from your backups. Just choose a day, time and how often you wish the backup to be performed, and your websites files and database SQL dump will be saved to your Dropbox account. VaultPress is a subscription-based (premium) real-time backup and security scanning service designed and built by Automattic, the same company that operates more than 25 million sites on WordPress.com. VaultPress makes it easy to keep an up-to-date backup of your site with both daily and real-time syncing of all your WordPress content. To ensure your site stays safe, VaultPress performs security scans daily and makes it easy to review and fix threats. BackupBuddy is a premium plugin for backing up WordPress sites, restoring the backup and moving WordPress to a new web server. With this plugin, you can run database backups for quick, small, frequent backups or run complete backups to get all your images, themes, plugins and everything else to a safe place such as an offshore server, cloud storage services (Dropbox, Amazon S3, Rackspace cloud), and email box. A free malware scan of your site. Automatically scans and repairs common issues with your database. View, delete, or manually run WordPress scheduled CRON jobs. Mass text search and replacement. Creating backups of your website isn’t fun. It requires a large chunk of time and technical knowledge. Thankfully, if your website is powered by WordPress, there are a lot of great plugins that handle backups really well. With so many options, choosing a backup plugin to use could be daunting. However, the review of six of the best backup plugins in this article could come in handy when making that decision. Aside from the ones mentioned, what other backup plugins are you using? Please let us know in the comments. Thank you for your contribution. I’ll check it out. Thanks for sharing such a useful backup plugins. Am currently using BackupBuddy and it works like a charm. Thanks for sharing this information. My favorite one is BackUpWordPress. It is very easy and convenient to use. Thanks for sharing this writeup .I can attest to using a Backup & Restore Dropbox plugin by WPAdm ( https://wordpress.org/plugins/dropbox-backup/ ). At first, I was using the free version, but when I launched my second website I started using their Online Service, which allows good schedule features and migration which is cheaper and easy to use. Database backup amazon s3 is the plugin that i have been using for quite a while now and it has never disappointed me.I use it to backup my database and also to restore database of my website.